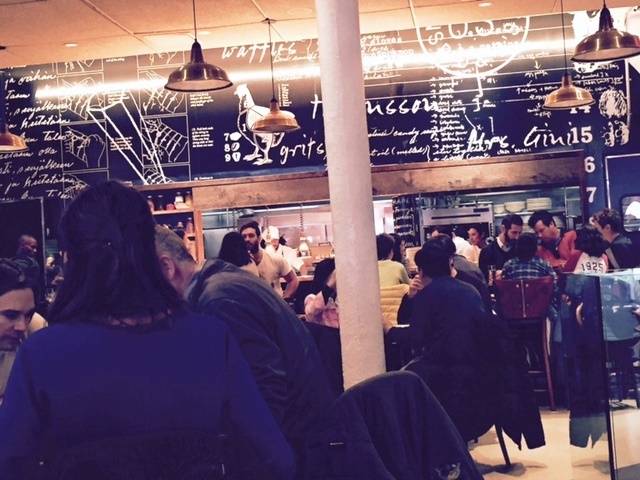 I have talked about Chef Marcus Samuelsson before–everywhere we’ve eaten his food, we’ve been pleased–from his old days at Aquavit (not the same since he left) to American Table at Lincoln Center, a quick, reasonable place to get a bite in that very crowded expensive area. But oddly it has taken me a long time to try Red Rooster in Harlem, already an important landmark in that area of landmarks. You ask me, is it good? it’s terrific. for those who don’t want to wait for a table. 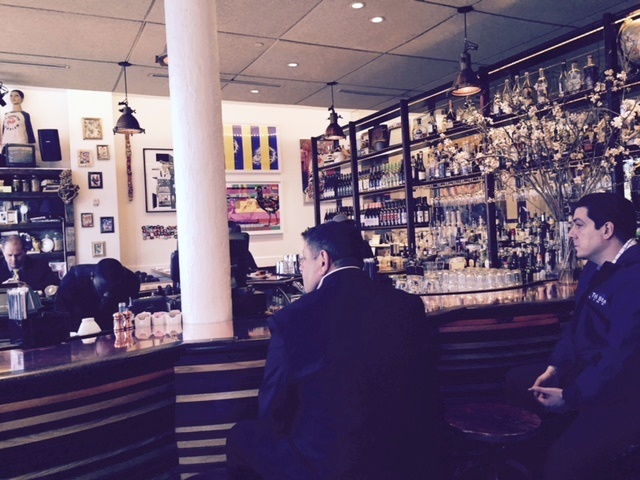 Be prepared to wait, however, and you’ll need reservations. 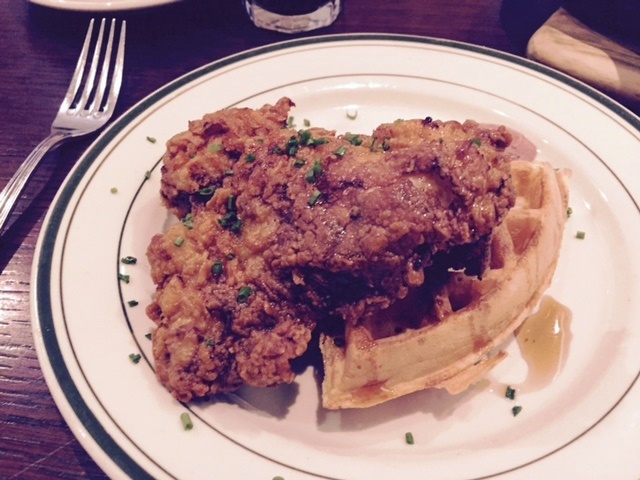 I ordered the appetizer sized single piece of fried chicken over a waffle ($16), and although I prefer my waffle crisp, the fried chicken was the best I’ve ever had and the amount just right for me. 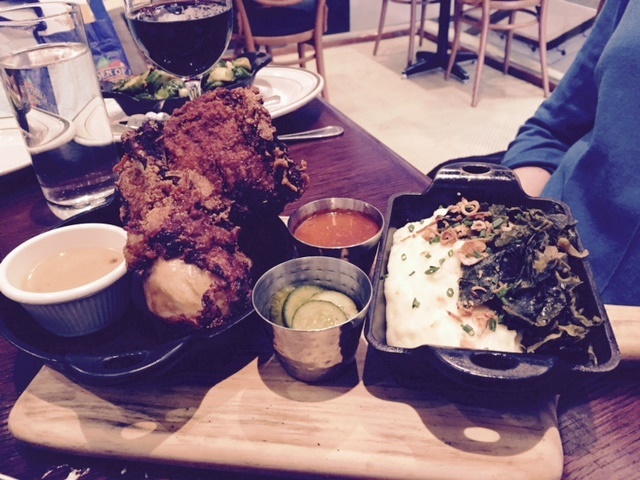 Mary Lou ordered the yard bird ($27)–be warned–it’s all dark meat–and it was splendid, complete with gorgeous mashed potatoes and stewed greens. 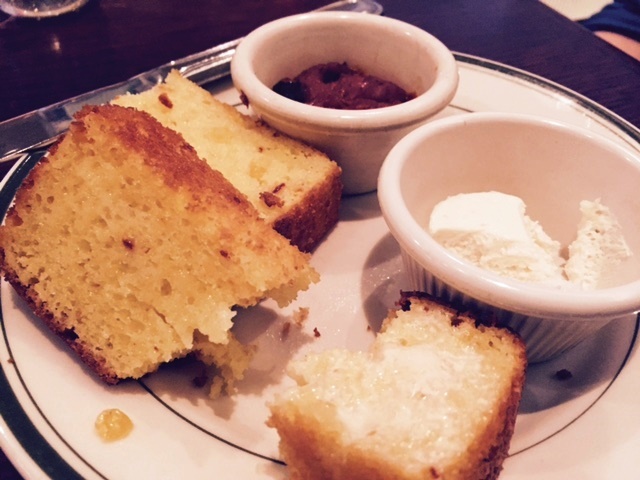 As a devotee of all things corn, I consider myself a connoisseur on this and the corn bread was really good, sliced and toasted. 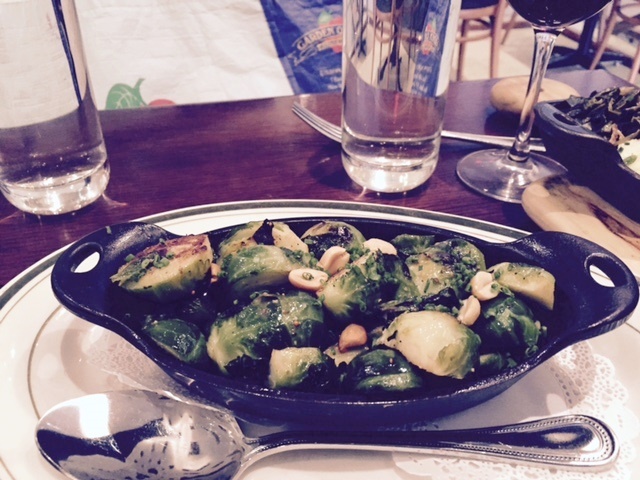 As a side, we were served with a cauldron of roasted brussel sprouts for $8. The menu definitely harks back to old Harlem favorites like blackened catfish and grits but includes Swedish meatballs for those who long for his Aquavit style. I couldn’t find the herring, however. There are also fine cuisine entrees like the duck made three ways. According to the Times, from 6 pm to midnight, it gets “insane. 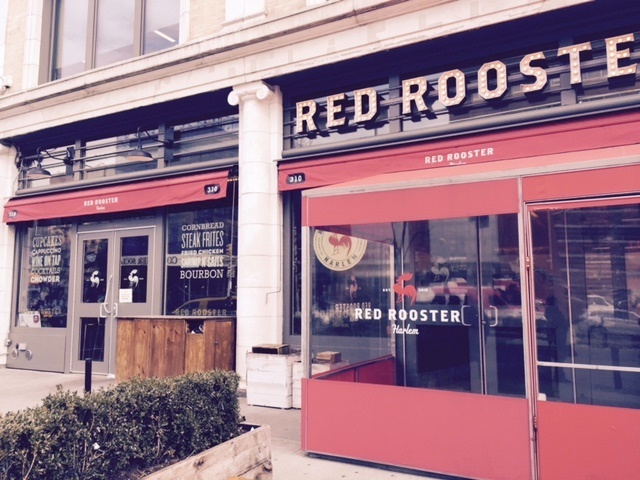 ..The glory of the Red Rooster is that everyone really is there.” At 310 Lenox Avenue (Martin Luther King Blvd) just above 125th Street, it’s easy to get to and you can be be there, too. Prices are reasonable for a fine restaurant and they have a $25 prix fixe lunch.